We have an well-known guest speaker and presentation scheduled for the April 4th meeting! 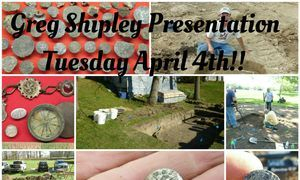 Greg Shipley will be giving a PowerPoint presentation and displaying his finds from excavations at the Ft. Loramie trading post site and Wayne's Legion troops. Pierre Loramie ran the Indian Trading Post from 1769-1782. It was burned to the ground in the 1782 expedition commanded by George Roger's Clarke against Indians in the Ohio territory. In 1794 General Anthony Wayne constructed Ft. Loramie on the site occupied by Wayne's Legion. The artifacts and relics Greg has recovered included many Indian Trade silver items as well as Military artifacts, buttons, coinage, gun parts and much more! This is a First class presentation by Greg, given at many schools and groups. We are fortunate to have it given to ODA in a smaller venue allowing more Q&A time with Greg.